WASHINGTON (Aug. 14, 2015) -- Continued freedom in America requires a continued commitment to maintaining strong, equipped, well-led and well-trained ground forces, said the Army's 39th Chief of Staff Gen. Mark A. Milley. "There are many who think wars only can be won from great distances - from space, the air, the sea. Unfortunately, those views are very, very wrong," Milley said. 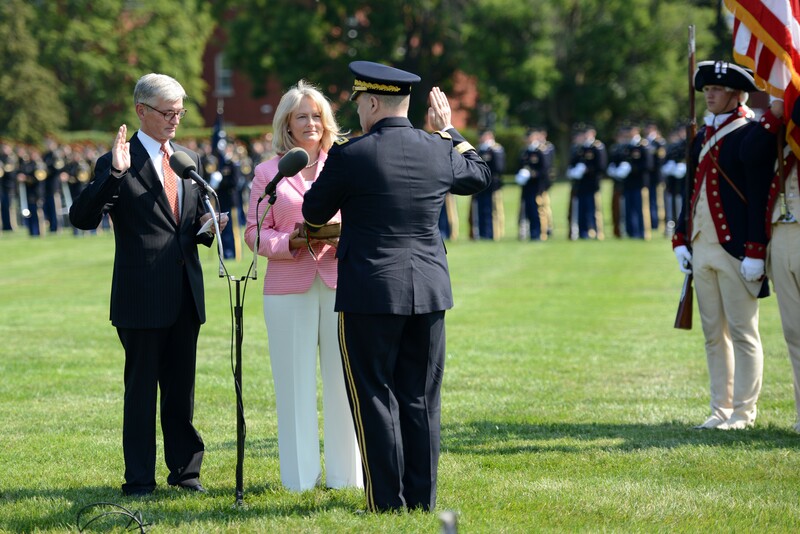 Army Secretary John M. McHugh, far left, swears in Army Chief of Staff Gen. Mark A. Milley as the 39th chief of staff of the Army during a ceremony on Summerall Field, Joint Base Myer-Henderson Hall, Va., Aug. 14, 2015. Milley's wife, Hollyanne Milley, holds a Bible. Milley spoke immediately following his oath as the new chief, assuming responsibilities from Gen. Ray Odierno, who retired during the same ceremony Friday morning on Joint Base Myer-Henderson Hall, Virginia. "War is an act of politics, where one side tries to impose its political will on the other," Milley said. "And politics is all about people. And people live on the ground. We may wish it were otherwise. But it is not. Wars are ultimately decided on the ground, where people live, and it is on the ground where the U.S. Army, the U.S. Marine Corps and the U.S. Special Operations forces must never, ever fail." The general warned that flagging commitment to maintaining ground forces will have a devastating cost, in terms of lives and freedom. "If we do not maintain our commitment to remain strong, in the air, on the sea, and yes, on the ground, we will pay the butcher's bill in blood, and we will forever lose the precious gift of our freedom," he said. "As your chief of staff, I will ensure we remain ready as the world's premier combat force. Readiness to fight and win - ground combat is and will remain the U.S. Army's No. 1 priority. And there will be no other No. 1. We will always be ready to fight today, and we will always prepare to fight tomorrow." Milley most recently served as commander of U.S. Army Forces Command on Fort Bragg, North Carolina, before replacing Odierno, who served as chief of staff for nearly four years and retired after having served 39 years in the Army. Odierno began his military career after graduating from the U.S. Military Academy at West Point, New York, in 1976. At the change of responsibility ceremony, the outgoing chief of staff remarked at how the Soldiers of the 3d U.S. Infantry Regiment (The Old Guard), performing there, reminded him of Soldiers still serving around the world. Soldiers still in Iraq "are the best of who we have - attempting to train and advise Iraqi security forces," Odierno said. "I think of our Solders in Afghanistan, continuing to build an Afghan army. I think of our Soldiers in Eastern Europe, reassuring our allies. By the way, a Soldier was the 'Man of the Year' in Lithuania last year. That's who our Soldiers are. They are in Republic of Korea, supporting our allies. [They are] fighting the global war on terror around the world. That's why I stayed in this uniform for so long - because of our Soldiers, and their dedication and commitment to this nation." Odierno also touched on both the officer and noncommissioned officer, or NCO, corps, saying they were the best in the world. The NCO corps, he said, makes the U.S. Army different than any other army in the world. "They are our standard bearers," he said. "They are what changed our Army over the last 40 years [that] I have had the opportunity to serve. It has been the changing nature of our NCOs that has transformed our Army. And they continue to do that today." Of officers, he said, he has confidence that they will continue to preserve America's freedom by providing competent leadership for the Army that protects the nation. "As we stand here, we have the finest officer corps, in my opinion, in our nation's history," Odierno said. "I have complete confidence in the officers that we have in the Army today and of their ability to lead us into an uncertain future." The Army today, Odierno said, is admired by America's allies, feared by America's adversaries, and remains an essential part of the joint force. 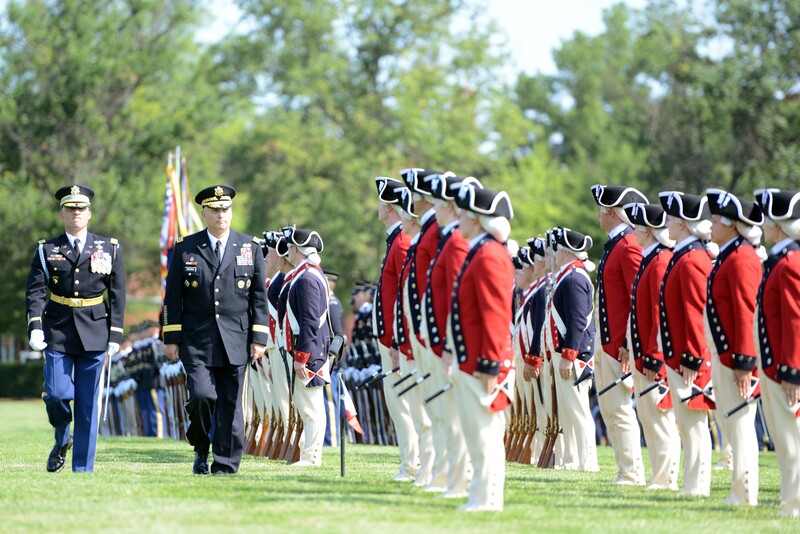 Now-retired Gen. Ray Odierno inspects the troops on Summerall Field, Joint Base Myer-Henderson Hall, Va., Aug. 14, 2015. "And I know they will continue to do whatever they are asked, wherever they might be asked to do it - they will be there prepared," he said, adding that with Milley, "The Army is in great hands." The general also credited his ability to continue to serve to the strength of his own Family - especially his wife, Linda, whom he said has stood by his side since he was a cadet at West Point. "She is the epitome of selfless service," he said. "She has always put others before herself. She has always been by my side through the good and the bad. She has always been the strength of our Family. She has been a role model for so many spouses throughout the Army, because she always treated everybody with dignity, respect, and with a little touch of love. She sacrificed her entire life for me. I can never repay her for that." During his time as chief of staff, Odierno served under Army Secretary John M. McHugh. During his tenure as secretary, McHugh worked with three chiefs of staff, including Gen. George W. Casey Jr. and Gen. Martin E. Dempsey, who now serves as chairman of the Joint Chiefs of Staff. "Ray is as fine an officer as I have ever known," McHugh said. "He's a leader wholly committed to the Army - doing so the last four years in Army headquarters. He's wholly dedicated to the people and relationships that compel our mission and to the broader strategy framed within the Department of Defense. More importantly, at all times he's been faithfully committed to the men and women of the U.S. Army, and the men and women of the U.S. military." McHugh said that Odierno "firmly believes that Soldiers are not in the Army, but they ARE the Army. It's always been his No. 1 job to serve them well and serve them honorably. And whether it is a fighting hole in Tikrit, or visiting a wounded warrior in hospital bed at Walter Reed National Military Medical Center, Ray has been the consummate leader, distinguished and thoughtful. He lead with a quick mind, calloused hands and a servant's spirit." Defense Secretary Ashton B. Carter told those at the change-of-responsibility ceremony that he has great confidence in Milley's ability to lead the Army into an uncertain future. "He's the right officer to lead the Army over the next four years, to shape our force, to continue restoring its readiness, to get there quickly and to win - as our nation expects of its Army. Mark is a leader, a warrior, and a statesman," Carter said. The secretary said he has had personal visibility of Milley's command ability. In 2013, he said, the two were together on the day that Taliban fighters attacked the U.S. consulate in Herat, Afghanistan. "As we flew there, I saw him take decisive command of the scene," Carter said. "In addition to decades of such operational experience, Mark clearly also has the strategic vision needed to build on what Ray started. I have confidence - I know he'll succeed, because he carries that same unyielding commitment to Army, to Soldier, and to family." Milley's new boss, McHugh, said he's seen Milley lead Soldiers both at home and overseas, as well as at FORSCOM. "At all times he's lead with distinction, in both war and peace," McHugh said. "He's a remarkable leader, and I'm confident he'll be an exceptional chief of staff of the Army and member of the Joint Chiefs." Dempsey said that going forward, the Army will be smaller and different than what it has been in the past. But the Army will still do what the nation asks it to do, and to do that, Soldiers must be well-trained, well-led and well-equipped. "You are an inspired choice to lead our Army into the future and you are going to be terrific," Dempsey said.